I haven't checked in for a while because we've been busy busy bees! I decided to finally set about redecorating our bedroom, and add those finishing touches to the rest of the house to make it more homey. Something about the prospect of another Autumn / Winter season approaching that makes me want to nest and begin making the home cosy for those dark hygge-filled nights. 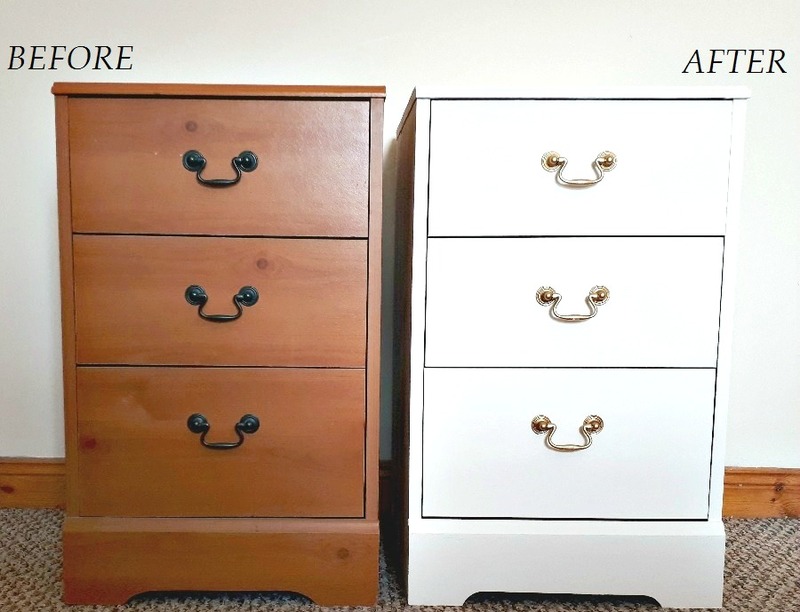 Since before I can remember we have had an old pine style chipboard furniture set in our bedroom, don't get me wrong, we were grateful when we were given it second hand by my Mother-in-Law but they're not necessarily our own style and I've noticed as time has gone on (we've had them years now!) that they pulled down the lighting in the bedroom. I've had regular opportunities to become even more acquainted with my bedroom over the past year and it looks to be more of the same upcoming so I was eager to make some changes, light and airy changes. We went and found a perfect new bed in a local store (which will arrive in a few weeks) and had decided that the silver grey velvet headboard would be the focal point of the room meaning it was time to change the furniture. But the bed somewhat eliminated our budget. Isn't that how these things go? So we had to get creative in changing the furniture. First we checked Gumtree, buy and sell groups were monitored (like a hawk), charity shops were scoured and auctions were picked over however there was nothing suitable at all and any bedroom furniture sets in white we did look at buying would have cost pretty much what the bed was already costing us... it seemed futile for a while and I almost gave up - until we decided to take a shot in the dark and pick up some budget friendly chalk paint... I mean if everyone on Pinterest could do it, surely we could too? For all my planning in life, DIY is something I can never really plan for and if I do make the decision to give it a go it's usually spur of the moment, with supplies purchased in haste and it has always turned out disastrously. I don't mind telling you that because this is a story that has a happy ending! 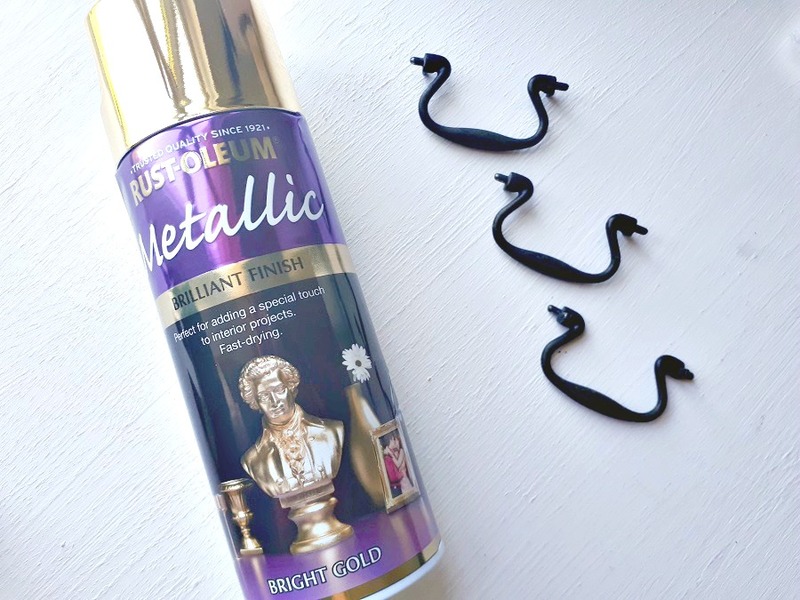 I purchased a tin of Rust-Oleum Chalky Finish Furniture Paint in shade Antique White for the grand sum of £11.95 and I (on a complete whim) picked up the Rust-Oleum Brilliant Metallic Gold Spray for £9. The brushes we picked up in our local B&M - we didn't have time or the know-how to go looking for special furniture paint brushes or anything fussy like that - we went for the cheapest brushes we could find and began hoping for the best however we were keeping ourselves grounded by constantly telling each other it was no big deal if it didn't work out. We had our work cut out for us, especially considering we gave no thought as to whether we were painting actual pine wood or whether we had chipboard cabinets to work with. It turns out we had the latter which isn't a great starting point for chalk painting, or so blogs all over the internet were telling us. It was almost over before it started. My main issue is patience, I just don't have any. I have tried throughout the years to work on this and some times this becomes more prevalent than others, like in the case of painting or DIY. Did we sugar scrub the units? No. Did we prime them? No. Did we just bang on in and hope for the best? YOU BETCHA! What I will warn you about is this, your efforts will look AWFUL after the first coat. 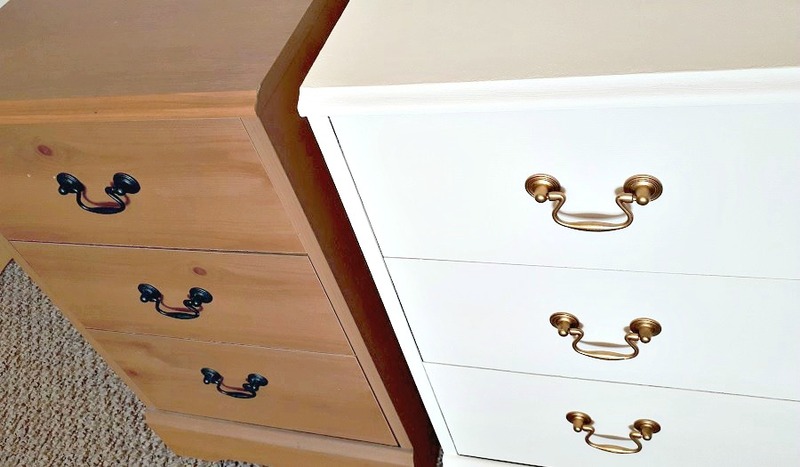 The second coat might well even bits out and may look relatively passable but we personally found it was after the third coat that the bedside table came into it's own. The change is amazing to be honest. I am still in shock! 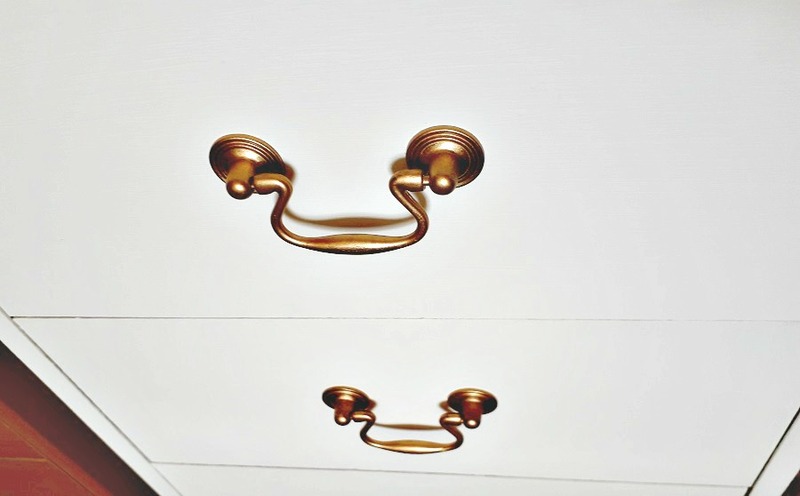 With the addition of the now metallic gold handles, the bedside table took on a hugely more expensive feel and it saved us having to change the handles completely. 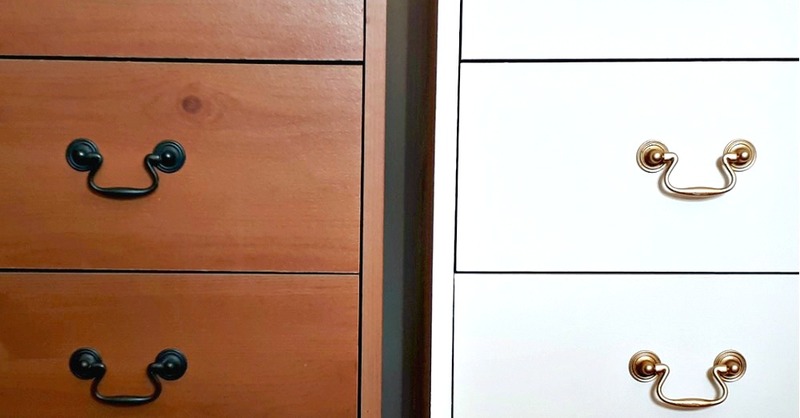 Down to the nitty gritty details... how much paint did it actually take to do just the one unit and drawers, because it wouldn't make much financial sense to have to use a tin per unit would it? Luckily we have half a tin left so you would easily get both units painted for a fraction of the cost of new furniture. The spray paint still has a substantial amount left as well, which is perfect considering we're now going to do the next bedside table, a chest of drawers and a dressing table. We painted this table over the course of 2 days. The chalk paint was relatively quick drying and we found if we put a coat on in the morning, we could add another by evening. The metallic spray paint dried faster, touch dry in an hour or so - great for my lack of patience! I will keep you all updated on all of the above projects as well as showing you, when it's finished, before and afters of the whole bedroom. 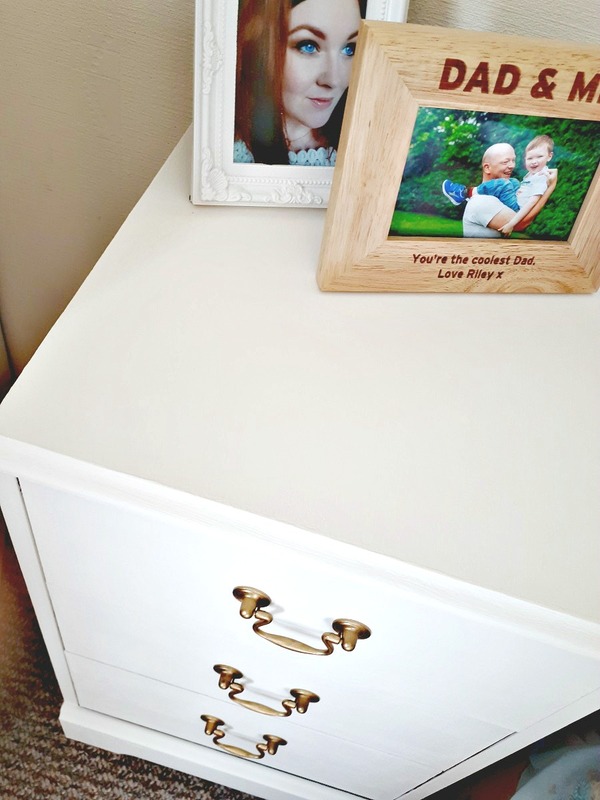 We've tried to keep costs low where we can and honestly even I was astonished at just how budget friendly this DIY stuff is! I'm still in shock at how well this particular piece of furniture came up considering we followed absolutely no instructions. 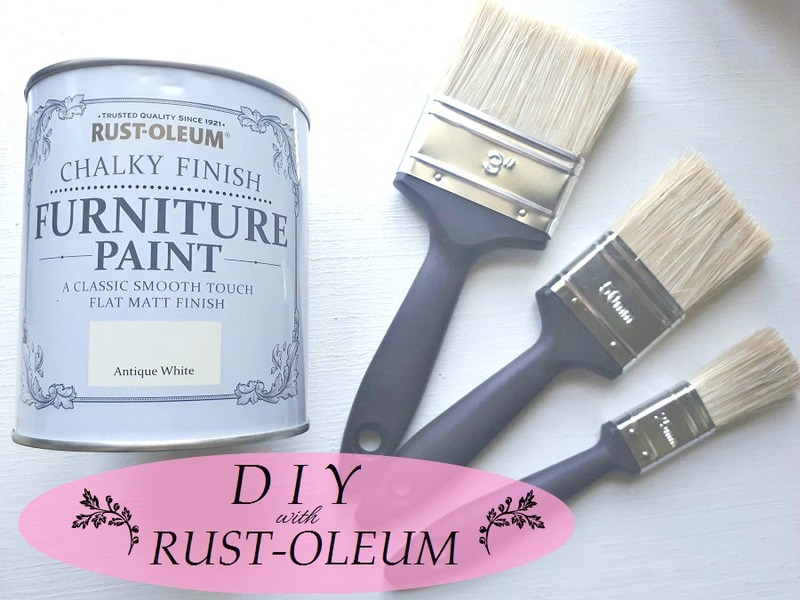 So, if you're considering painting some furniture yourself trust me when I say you really can't go wrong with Rust-Oleum chalk paint, it's pretty much foolproof. Can't afford spendy paintbrushes or buffers? Forgot to sugar scrub? That's ok! 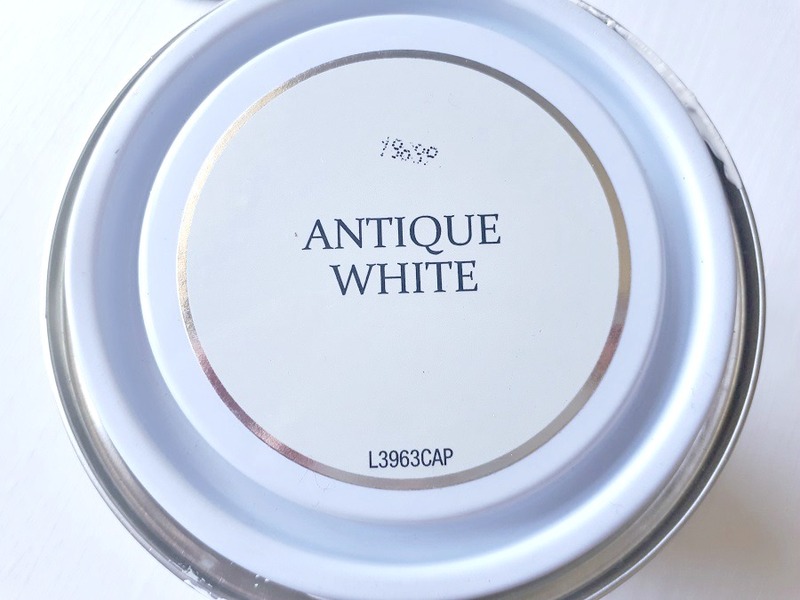 Whatever you do though, DON'T freak out after the first couple of coats that you've ruined your furniture, give it the 3 coats and then marvel in your new-found DIY status.